Hello everyone! Looks like a lot of you will be starting to use the new Reading Wonders basal series this year. My district in Indiana adopted it last year, so I have been through one full year with it in second grade. I have had a lot of questions about what I did and didn't use, etc. I think that it is all going to depend on your school and district and what you do and don't need to use. For example, I am under the impression that we are pretty much expected to use it. (Imagine how much money they spent on it!) Plus, I'm in the largest district in Indiana, so a lot of things are set up for us. Curriculum maps, calendars to keep us on track, etc. That is all district specific stuff. We don't ONLY use this basal, we do use other things. For example, we don't use the spelling or the writing that is in Wonders. So please keep that in mind when you see my outline below. We are required to have a 90 minute literacy block (writing is not included here, that's separate) and at my particular school last year, we did a 120 minute block in K-2. That extra 30 minutes was typically independent reading and independent reading conferences. Also, I teach in an inner city school with very high poverty and a very high ELL population. My whole group is 30 minutes, but the real "meat" of what I do is in workstations and small groups because without differentiation there, I would never meet half of my students needs. Wednesdays-review of words above again, then read the story in the Literature Anthology together. Apply skills for week to story. Thursdays-Usually there is a short poem or article to read in the literature anthology. Apply skills. Sometimes I'd do my own read aloud and apply the skills from the week. And overall a "catch up" day to go over grammar skills for week, etc. Fridays-Weekly Test **I only gave the first half of the test. One passage (two pages long!) and 10 questions. I did that for probably 75% of the year because they still weren't ready to move onto the full length test. Plus just half of a test would take them a good hour. Also, I read the test aloud and we worked on it question by question same time until December. After December, I let them try on their own, except my special cases that would sit in a small group with me and I'd read it with them. The kids had a hard time with the tests all year, but we didn't give up. They got better and better eventually. I will have to compare to this year's group because last year's group was honestly very tough, so I don't know if it was Wonders or that class. Also, I did do one of the written response questions on the shortened test. Usually the written response question included was about both passages, which they hadn't read, so I would just do a little cut and paste (literally) and fix the question so it was just for the passage they read. I made a big deal about the written response and use RAPP in my classroom. See my blog post on RAPP here. I'm remembering what I did do everyday for my WHOLE GROUP Time, but it's hard for me to remember what I left out (since I didn't do it! LOL) One thing I STARTED the year with was the Interactive Read aloud. In our quick training we had by the company they made a big deal of this and I felt I needed to do it. I DID try it for a few weeks but in MY opinion, it ended up being a big waste of time, so I discontinued it. With only 30 minutes for whole group, I had to pick and choose, as you are figuring out when you go through the text yourself. Another question I was asked was if I did the "Review Week." For the first part of the year, yes, I had a review week/week between two units where we worked on a big "Unit Test" that was included in the series. However, I chose to do it as more of test taking strategy lessons without a grade. We worked hard on this and talked about how they'd take the state test in 3rd grade. Now, halfway through the year, Indiana was hit with one of the worst winters ever, so we ended up having to skip the review weeks in order to get through all 6 units because our time ended up being limited. But it was still okay, it was nice to do those test taking strategies in the beginning. I'm sure this year will be different and I will use some things that I learned from using Wonders last year. I am also at a new school this year where the weekly test data is required to be turned in. I have yet to find out if they are to take the entire test each week or if I'll be allowed to still cut it in half. This of course worries me. The kids need experience in taking a long "standardized" test since that's what their future is, but I can't imagine how long it will take them and how they will do at the beginning. You are probably wondering more about what I do in what I call the "meat" of my literacy block: Small groups and literacy workstations. Last year, I used all of the literacy workstations that I created for Wonders, plus some others and differentiated them. If you follow my blog, I had a "Workstation Wednesday" series in the spring where I went into great detail about my workstations. As for small groups, I differentiate those to meet the needs of each group of students and often they are different from year to year. 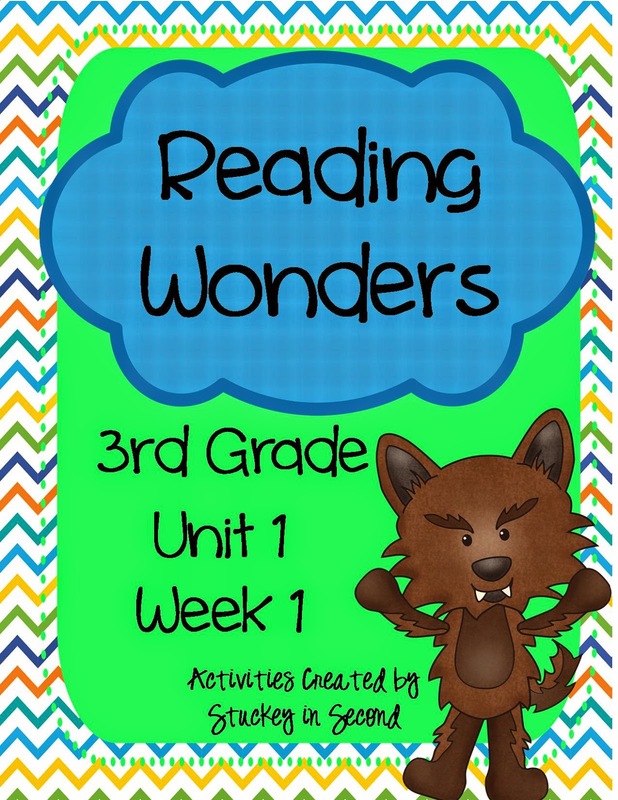 I use many TPT materials and I do use the leveled readers from Wonders, if the level fits a particular group of students. However, sometimes a group will fall between some of those levels and I'll have to resort to other leveled books from my school's bookroom. I know this is a lot, and you might need to read through all of my babbling a few times. But I truly hope that I can at least help if you are overwhelmed with the series, and I hope I didn't overwhelm you anymore! 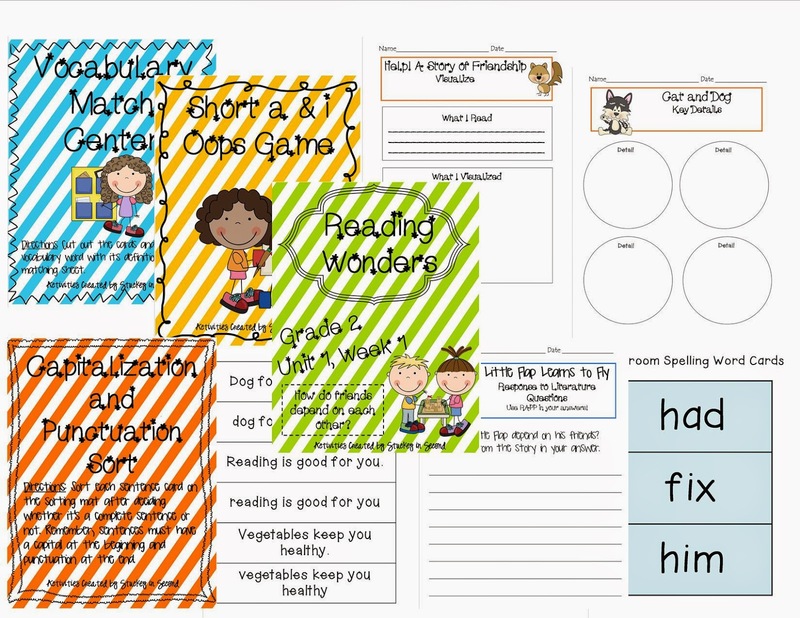 My resource packets that I've made include workstations/centers, graphic organizers, posters for a focus wall, high frequency word cards, vocabulary cards, plus more. Please download a free copy to see if you think it will help you this year! Just click on the pictures below. I have 2nd and 3rd grade resources. 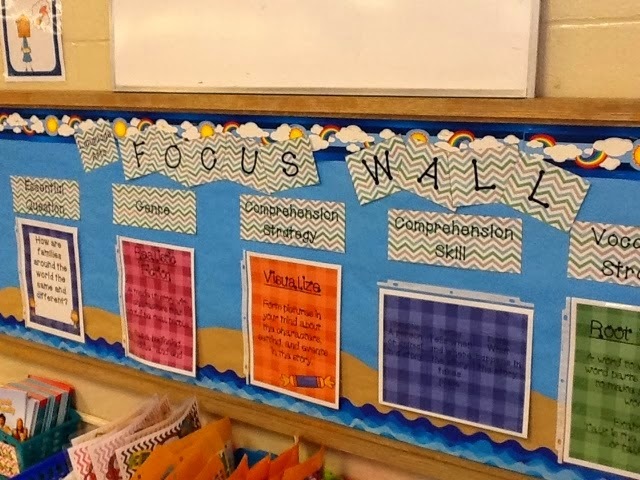 Also, here is a picture of my Reading Wonders Focus Wall and you can download the titles/headers for it free! If I think of any other information that I feel is too important not to share, I'll update this post. If I update, I'll let you know on Facebook, so be sure to follow my Facebook page! Thanks for writing this post, Allison!!! :) We have two more weeks until school begins, so I am in crunch-time mode trying to figure out Wonders! Thank you so much for your insight, Allison! It was helpful in thinking about what is ahead. I really appreciate you taking the time to write about your experiences with Wonders on your blog. Enjoy the rest of your summer! Thanks for the response. I hope it all made sense! We used Wonders and were required to give the entire test all year. It was weighted at 50% of their final grade. It was a nightmare to say the least. Hopefully our new admins will make some changes this year. Our district has a spelling procedure/program that we use. It's mandated but some of the words in that list are from the wonders phonics skill. I put the spelling words from wonders in the packets because I know that's what others use. That's the only thing I don't exactly from my packet. I just know MOST people follow that spelling. Sorry if that's confusing. As for writing we use Kristina Smekens and Lucy Calkins, which is also mandated by our district. I hope that makes sense! ;-) Also, sorry for the delay, I just saw this comment and question. I am going to try centers using your plan as a model (I am adapting it to fit my room/kiddos). I am wondering what you do during your small group lessons. My original plan was to read the story in small groups but I was looking to see if someone else had a better idea.